The dual stage, track drive HSS1332CT is powered by the reliable, easy starting Honda GX390T2 commercial grade OHV (overhead valve) engine, clears a path 81.0 cm (31.9 in) wide and 55.0 cm (21.7 in) high and provides snow discharge up to an amazing 75 metric tons (83 tons) per hour, at a distance of up to 17 m (56 ft). The variable speed hydrostatic transmission features a single lever for quick switching between forward and reverse, and for accurate adjustment of ground speed without affecting auger rotation speed, while the steering assist drive system improves manoeuvrability with or without engine running with the new fingertip trigger steering control allowing precise turns for unmatched on-the-fly steering. The hydraulic-assist auger height adjustment control allows on-the-fly adjustment of auger height for optimum performance in varying snow conditions. 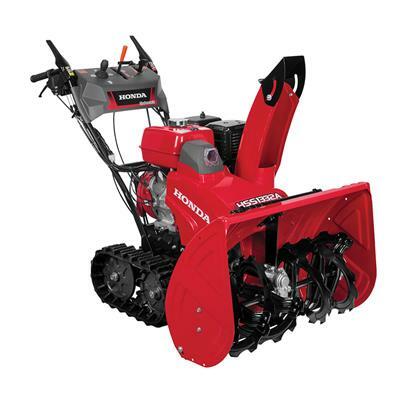 It comes with a 3 year residential/commercial warranty, it's certified to meet or exceed EPA emissions guidelines, it's highly operator-friendly, and the HSS1332CT has the Honda power and technology to clear the heaviest snowfalls and the largest areas with ease.